Peta Johnson may be rich, famous, and adored, but it doesn't protect her when the man she married turns out to be a monster. With her little girl missing, Peta will do anything to get her back – including returning to the small Western Australian town she vowed never to see again. Jaime Caruso left his heart in Williams when he left to pursue a military career, but it soon shrivelled and died when he discovered the girl he loved didn't love him enough to wait. Back in town to help his ailing father, Jaime struggles with the memories and plans to leave – permanently – as soon as possible. But then Peta returns and Jaime gets swept up into the nightmare she is living. Feelings long buried soon bubble to the surface, and as they race to save the life of the daughter Jaime doesn't know is his, they must decide if life – and love – really does give second chances. Born in Port Elizabeth, South Africa and now proudly Australian, Juanita is a freelance editor and proofreader. She escapes the real world by reading and writing romantic fiction. The year 2012 was a turning point in her writing career, with her debut novel Fly Away Peta released in August. Her short story Rough Diamond also made the finals in the Romance Writers of Australia Little Gems competition and was published in their Diamond Anthology. Juanita is a keen volunteer and member at the Romance Writers of Australia. When she's not writing, editing or proofreading, Juanita is the cleaning fairy and mother to three boys (hubby included, his toys are just a little more expensive). Her not-so-miniature dachshund, Sam, is her critique partner and keeps her company while writing. I've read all the books in Juanita Kees' Tag Raiders series, now rebranded to 'Under The Law', including this novel when it was published as Fly Away Peta. Juanita Kees has always been a writer of wonderful award-nominated rural suspense stories but in recent years has added 'rural romance' to her genre list. I think this new Under The Law series is a great blend of these two styles for Juanita, bringing small town West Australian rural settings with a romantic suspense twist. This book has been significantly reworked, and I think is much improved for this effort. The relationship between Jaime and Peta is one of my favourite romance tropes, 'second chance' and the hunt for Peta's daughter adds to the stakes in this. A fitting beginning to a new rural suspense series by one of Australia's most popular romance authors. I really enjoyed this book it held my attention from the first chapter to the last. And left me wanting to know more about these people. Thank you Juanita Kees for another well written book. 5.0 out of 5 starsLove, mystery, hostage situation, family interference, and more.Wonderfully written and told a wonderful story. Peta Johnson is a big star in Australia, however, she has never forgotten the small town she came from and then the man she left behind. She met Jaime Caruso as a young girl and they fell totally in love with each other. However, Jaime’s parents had his future all planned and Peta did not fall into that plan. They had his wife picked out (to combine 2 very old families together), an arranged marriage as his mother’s marriage had been. Jaime was to also take over the family business, which he did end up doing. But Jaime left things behind and went into the military. He only came home when his father’s illness became so bad that he could no longer handle the family business. Peta was left behind, pregnant and had her own troubles. She was depressed, suffered issues from being pregnant and then anorexic and so on. But little Bella was born and turned into the most beautiful young lady at almost 10 years old. The daughter Jaime never knew he had. It has been set by parents that Jaime could not get anything through to Peta and he was to know nothing about Bella. Peta met and married Paul and became a star, but then came a night club, issues with gangs and much more. Peta had more than once became Paul’s punching bag and to top it off he kidnapped Bella and made his threats if Peta did not do what he wanted. Peta returns to Williams her hometown, Jaime returns and finds that Peta is having troubles. It comes out that Bella is his. Now, will they survive before anyone gets hurt? What will happen between Peta and Jaime? Juanita Kees held my interest from start to finish. Wonderfully written and told a wonderful story.. Love, mystery, hostage situation, family interference, and more. This is a fast paced action filled story that is also very sensual and emotional I ploughed through this one with its fabulous story line of lost love, kidnapping and the underworld my recommendation is sit back with a drink and enjoy. Peta Johnson is a singing sensation from the small Western Australian town of Williams but after her first and true love left her nine years ago without a word Peta moved onto a new life with a husband and her daughter but when that husband turns out to be such a monster Peta needs to return home to do what she can to save her daughter Bella. But then her life does a big about turn when Jaime Caruso is also in town the man she has never stopped loving and that spark is still there but will a secret bring them closer or push them apart? Jaime moved on nine years earlier due to pressure from family he took off and joined the army did his tours of Afghanistan but always kept in touch with his best friend Peta’s brother Detective Sargent Mark Johnson and was always told Peta was happily married so when he meets her again he is stunned to find out what has gone on with her and when he finds out about Bella, Jaime is determined that things are going to change because he has never forgotten Peta. This is a beautiful and edge of your seat story Peta and Jaime had both been young years before but now is the time for second chance love the secrets are out the family involvement is out and life could not be looking any better for these two people it is now time to start anew with their family. It was great seeing Paul Peta’s ex get is just deserts but this will definitely see another story bring on Mark’s story. Thank you MS Kees for a fabulous story and I look forward to more in this series I loved this one. 5.0 out of 5 starsThoroughly enjoyable romantic suspense! When her ex-husband kidnapped her ten year old daughter Bella, Peta Johnson was devastated. Paul had ended up in the wrong crowd and his cruel and tormenting ways toward Peta had escalated until she’d finally seen sense and divorced him. Peta was a well sought after singer, situated in the city of Perth, Western Australia, and her return to the small town of Williams was something she didn’t think would ever happen. But she would do anything to get her daughter back and that included returning to Williams. Detective Senior Sergeant Mark Johnson was Peta’s brother, and along with his partner Detective Harold Jones, they had her safety and Bella’s at the forefront of their minds. Mark was also a good friend of Jaime Caruso, the guy who had left Peta all those years ago – walked away and didn’t look back. She had been shattered; her love for Jaime had never abated, but her anger was still there. And her mistrust. So when Jaime appeared in front of her, she was shocked! Peta hadn’t seen him for ten years – what was he doing there now? But the danger from Peta’s ex-husband was real – he was psychotic; determined to get what he wanted. And that was Peta. Suddenly they were swept up in a nightmare that wouldn’t go away. Would Peta find Bella? And would Jaime leave again? Break her heart again? 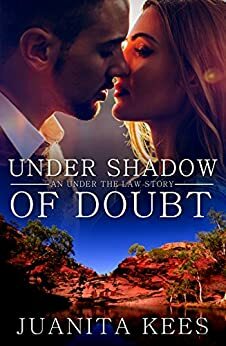 Under Shadow of Doubt by Aussie author Juanita Kees is an excellent romantic suspense novel that I couldn’t put down. The pace was electric, the plot brilliant. This is #1 in the Under the Law series (and originally titled Fly Away Peta; reworked and edited with significant changes) and I’m very much looking forward to book #2. Highly recommended.